Hey friends! Unbelievably, I'm already six months along in this pregnancy with baby #2. Unreal, right?! Time flies. Before we know it, he'll be here and will be ready to enjoy his own room. Guess it's time to get crackin' and plan a nursery! Anyways, my nursery scheme for baby Deuce started off with a bath mat. Seriously. This is H's bath mat right now. The colors are off in this photo, but it's basically got a few shades of aqua, a few shades of yellow and some brick red and orange. I'm smitten. And have decided to design baby #2's room around it! I'm thinking we'll paint the walls a light, bright neutral like the gray color pictured. I really want to get him a stained wooden crib, but will otherwise use mostly white furniture in the room. 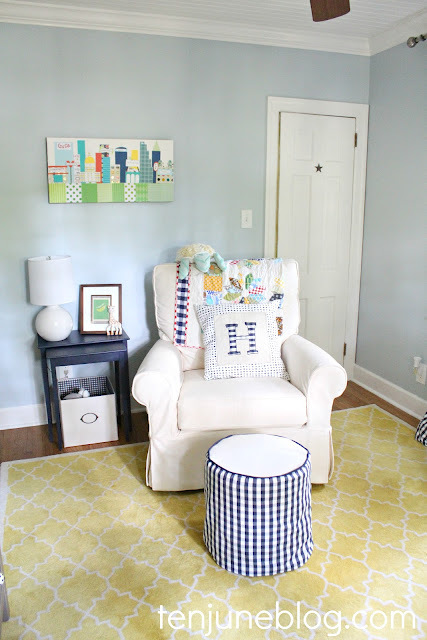 I also plan to use a lot of the same elements from baby H's room... the same mobile, a large off-white rocker and another custom quilt (that's already in the works!). 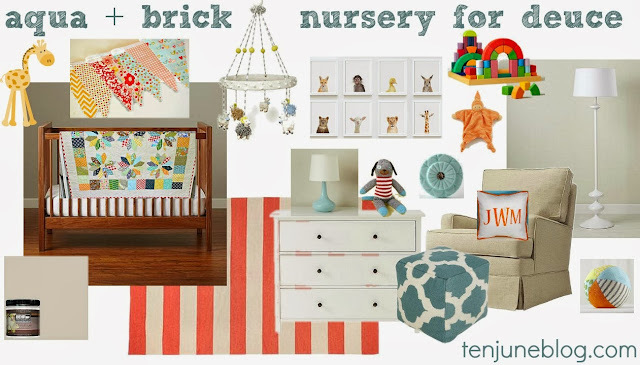 But instead of navy and yellow like H's room, this room will focus on mainly aqua and brick red. And lots of other colors, as you can see... 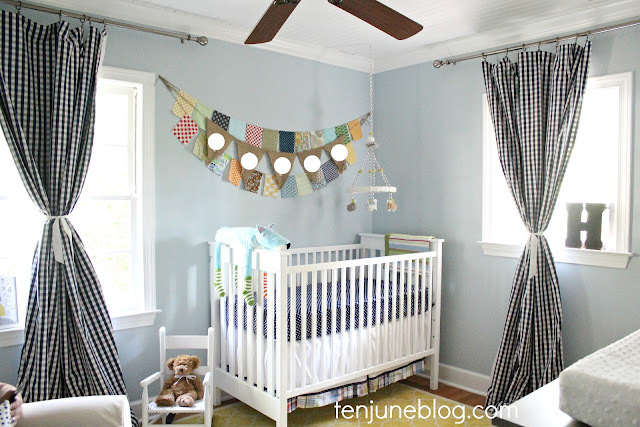 I'm a big fan of including many colors in a baby's room to stimulate their senses. I just love the red striped area rug. And will definitely create some sort of aqua + red + yellow + orange patterned wall hanging of sorts. You know I have to DIY for this baby, especially after making H his scrapbook paper cityscape art, his color-blocked rocking chair and his DIY black out curtains. I haven't decided on curtains yet... would love a non-geometric, non-nurseryish pattern but I haven't found exactly what I'm looking for yet. Any suggestions? What do you think? I'm still all over the place with sourcing, so if you can think of anything else out there that may fit this room, hit me up! If you're curious, the source list for HDawg's room is right here. PS. I plan to run a Tuesdays at Ten June feature next week, so send me your recent projects! 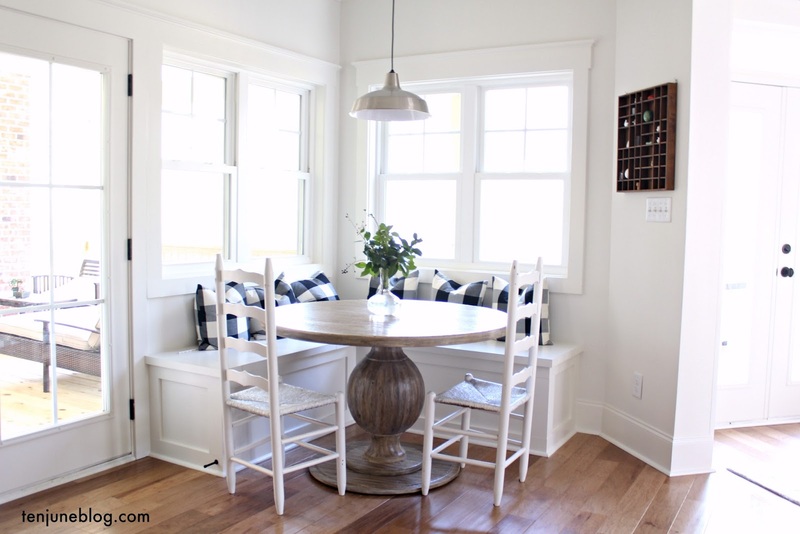 Any DIY... room makeovers, projects, crafts, holiday, recipes, kids... I love it all. Email it to me at tenjuneblog@gmail.com with the subject line "Tuesdays at Ten June" or tag your photos on Instagram with #tuesdaysattenjune. LOVE the new design! i love the colors- love the artwork especially! Super cute! Love the color scheme. Swoon! I love it so much! Oooooh I love the color scheme!! Can't wait to see it in action! Couple of questions for you- 1. did you DIY the big oversized rocker or is it store bought? I've seen people hack the Ikea chairs, and I can't remember if you did that or not. 2. Your hemnes dresser- how has it held up? We have had one for almost a year now and I'm noticing what looks like a little sagging in the middle. I wanted to get one as a changing table for my son (he's so long he's outgrown his current table), but I'm worried about how it will hold up! Love this, I have always said if we have another boy it would be a circus nursery! Love all your picks, especially the pennants and rug! Love the color schemes, that blue and orange look superb together! 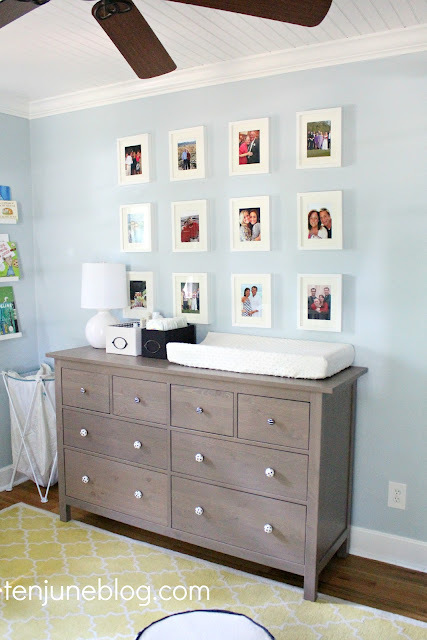 Plus that IKEA dresser is my favorite - we have the same one in white in my daughter's nursery! I love these colors and all the details - such a great room! Can't wait to see it come together! You can get ideas from here to build the baby room baby nursery decor, room themes, design ideas. View thousands of pictures of baby nurseries, playrooms, baby showers and more in our photo gallery. 1. I love the nursery plan- I loved Hdawgs too!